There is perhaps no more shocking realisation of the extent of plastic pollution than to measure it at the extreme reaches of the world’s oceans. And Dee Caffari was shocked. 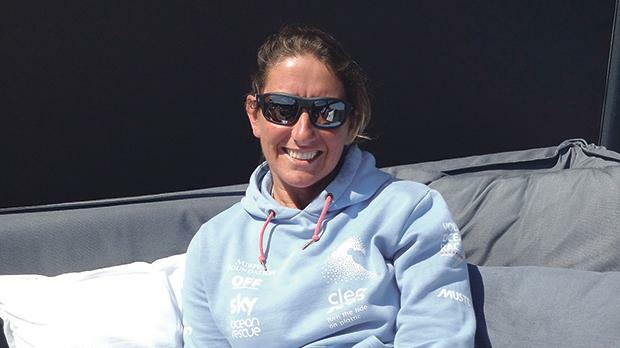 She was well aware she would be seeing more and more plastic as she sailed around the world, but it was only when she skippered her boat Turn the Tide on Plastic in the Volvo Ocean Race that she realised how bad things were. The sailor, a descendant of a Maltese sea captain some generations ago, captured hearts when, in 2006, in her early 30s, she became the first woman to sail around the world alone. She has now done that trip three times non-stop, not to mention having managed it solo in the other direction. Ms Caffari admitted she was shocked by the increase in plastic since her first foray across the oceans. And this time, she was certain it was not just her own raised awareness that made her sit up and take more notice. “Was I seeing more because I was looking for it? A lot of my crew are young and inexperienced; the majority are under 30 and doing this for the first time. But even they were commenting on how much rubbish and plastic and pollution they were seeing. I realised it is genuinely a problem and it has got worse,” she told the Times of Malta at The Hague, where the race ended last week. Her awareness was not that of the casual observer: her boat was backed by the Mirpuri Foundation and the Ocean Family Foundation and had a mission: to highlight the UN Environment Clean Seas campaign. The boat collected 68 samples over the eight months and 45,000 nautical miles of the race. Only two, from the south of Australia and east of Argentina, contained no microplastics. “Before it was someone else’s beach, someone else’s ocean, someone else’s river and not their problem. But now microplastics are everywhere. It is not just about what we see but about what is breaking down and getting into the food chain. It is in the fish and chips we eat on a Friday night. I think that now people are realising this is an issue and that it is everyone’s problem. “And it is everyday behaviour that needs to change: to amend legislation and to drive suppliers and manufacturers to change,” the 45-year-old said. The Volvo Ocean Race has been instrumental in collecting information and raising awareness in the 12 ports it passes through. But Ms Caffari will not stop there. World Sailing has launched the World Sailing Trust, a new global charity that she will chair to promote the health of our oceans. The world is slowly but surely sitting up and taking notice, from city initiatives to corporate ones. The Hague marked its role as the final port for ocean-weary sailors by signing up to the UN Environment Clean Seas campaign and setting out a plan to make all plastic products recyclable. 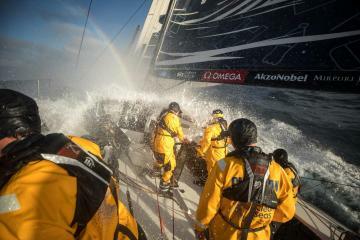 Most sailors who finish the Volvo Ocean Race say “never again” but they rarely mean it. These extraordinary people have become legends in their field, choosing to endure eight months in some of the most harrowing conditions known to humanity. Ms Caffari seems to have missed out on the whole “never again” phase, fired up by the thrill of pushing as hard as she could on Turn the Tide on Plastic, which came in sixth. “This project has been huge, not just the race but also to discuss our ocean’s health and amplify the message. I would like to go again, so now the task is to find the finances and the support to make it all happen again,” Ms Caffari said. The most recent data taken from sub-surface seawater samples collected on board the Team AkzoNobel and Turn the Tide on Plastic boats showed 75 particles of microplastics per cubic metre in one sample taken off the US coast following the stopover in Newport, Rhode Island. Levels of 73 and 76 particles of microplastics per cubic metre were recorded as the boats headed towards the mid-Atlantic. These could be connected to the edge of the North Atlantic garbage patch, one of five ocean ‘gyres’ estimated to be hundreds of kilometres across in size. In the mid-Atlantic, 63 particles of microplastics per cubic metre were recorded, while close to Cardiff, levels were slightly higher, at 65 particles of microplastics per cubic metre. The highest levels of microplastics found so far, 349 particles per cubic metre, were detected in a sample taken in the South China Sea that feeds into the Kurushio Current and the North Pacific Gyre. The next highest levels, 307 particles per cubic metre, were found at the point where the Mediterranean Sea and Atlantic Ocean meet.